A screen capture of Google's geo-mapping of my cell phone metadata. With an uncertain sigh, I clicked the button to activate my Google tracking on my cell phone. I wanted to see how accurate the data Google accumulates is, see what it says about me, consider how the internet Timelords might use it (for better or worse), and reflect on the larger role my information has in benefiting our society. Adjacent is a screen cap of the information Google accumulates, mine being just one user for one day out of millions using their Android systems. It's a telling story of an atypical day: I grabbed breakfast with my supervisor in Golden, took some comp time and did a flight lesson primarily practicing runway landings at Centennial Airport, headed to the office for a few hours downtown, and then headed to small groups at my Unitarian church. Anyone with this data could likely fill in the gaps through gleaning more metadata from Facebook, online purchases, texts, and G-Mail (all pieces in this case Google could have access to). The image of my daily adventure is just the surface of this data iceberg which runs deep into the cold abyss. Ever wonder how Google Maps Traffic gets so specific, with red lines guaranteeing delays as you rush around town for last-minute holiday shopping? 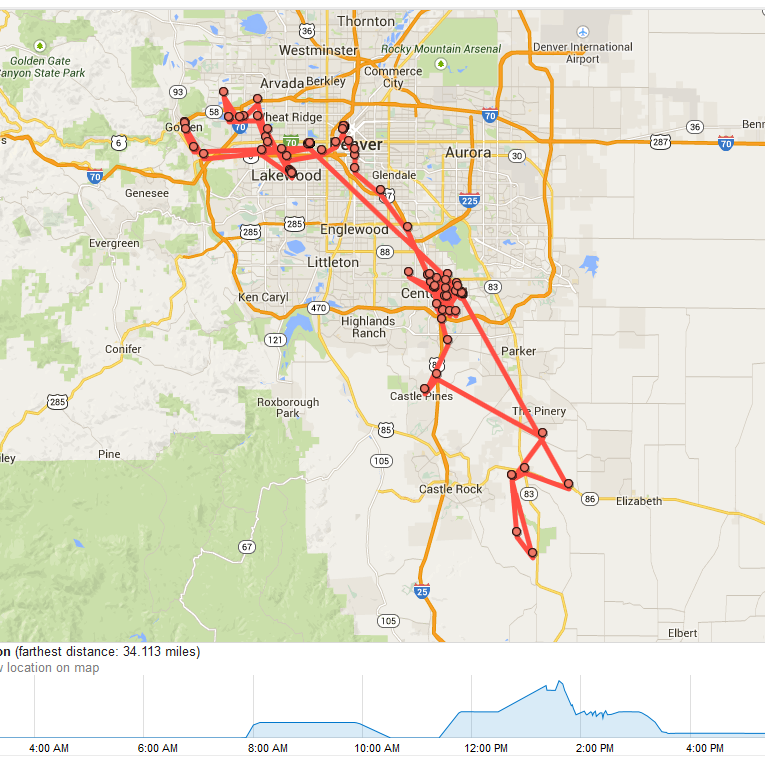 Google's data tracking of the geolocation of my phone goes into their servers, a coded algorithm interprets the data to something like: "Bryce's phone is traveling faster than a brisk walk along roads, therefore he is likely driving," and it's collected as just one sampling of many dozens along those same routes. Put those routes together, and you get an average speed of traffic. If it's below the average, that's where those pesky yellow and red lines come into play. 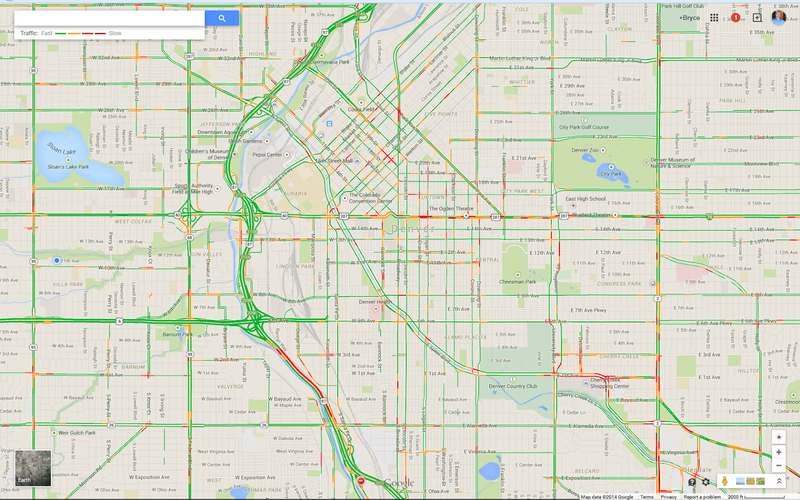 Google Map's Traffic Map for the Denver region. Google's data gleaning and analysis excites me because the change I want to see is how we work toward making our communities more sustainable. Cherry Creek (bottom right in the above image) is bludgeoned with holiday shoppers-- so why not find out where they're coming from and explore alternative transportation options from temporary shuttles to free light rail passes? For longer term thinking-- ask why are people commuting across the city there? Who are the winners and losers in these scenarios, and how does this access reflect upon race and class for our city? What types of development could we focus on to provide better balance to the city? Information is power, and power can create change. This data is important for making our communities healthier. Years ago I had a conversation with a man who said he was a contractor for the government, working with information technology. I offered he worked around building information collection and analysis algorithms for developing individual profiles to determine potential high-risk individuals for national security. His mouth was agape as I smiled and said, if all the companies are already doing it, I'm sure the federal government is playing catch up. Companies like Google are easy to pick on, but there are countless others in this game working toward similar goals. PRISM, Snowden, and NSA became household names since then as cries of accountability continue, but I found myself shrugging it off because they're not the ones I'm worried about. I had completely gothrow your post and it is full of innovative information.thanks for sharing this. Copyright © 2004-2013 Bryce Carter. Picture Window theme. Powered by Blogger.